« Promises, promises. The north side boardwalk remains incomplete. Memorial Day weekend finish looks unlikely. La Pierre, Ocean Grove, looking for tenants—in Asbury Park. Banner on the pink La Pierre, facing Asbury Park, says “Now Renting.” Blogfinger photograph May 21, 2018. © As seen from the A. Park side. Click to enlarge. La Pierre as seen after the March 2017 fire. 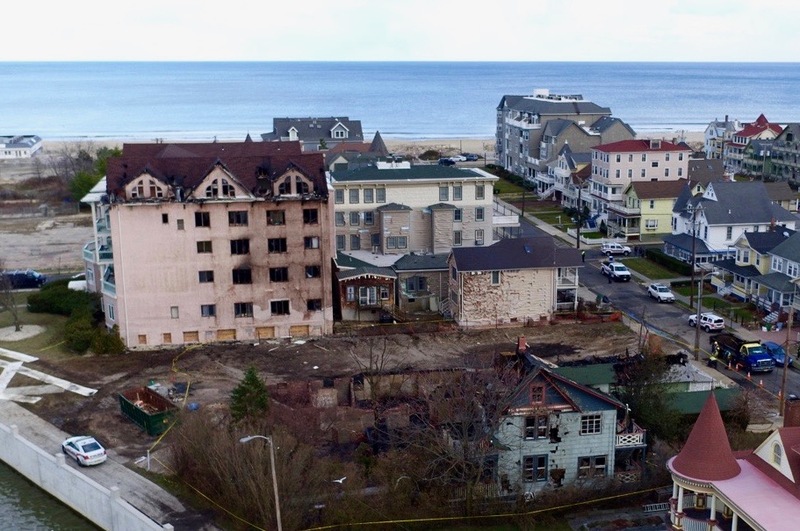 The empty area at the site of the Warrington Hotel remains undeveloped due to a zoning dispute with Neptune Township. Photo by Gary Colyer. The La Pierre condominiums (16 Lake Avenue—-with no parking) had severe damage during the Warrington conflagration of March 3, 2017. The La Pierre is located between the Ocean and Founder’s Park. Their rental banner suggests that they have completed restoration of that building. The work began quickly after the fire. The La Pierre has condominiums for sale and rent. It used to be a historic hotel with 100 rooms; the condo conversion took place in 1988 with 36 units. You can see the excellent retaining wall there, but the wall uglifies on either side. The wall particularly needs to be restored at the east side of Lake Avenue, near the boardwalk. That presumably will be paid for by the North End redevelopers. This is not good for the evolution of OG as a historic district with its own objectives, values, and culture. Those who set their sites on A. Park will likely not care much about the historic small town vision for the Grove. And the North End Redevelopment Plan will create an appendage to A. Park, ie South Asbury Park in O. Grove. Whatever housing is eventually placed there will be all about the proximity to A.P. not the proximity to O.G. proper. BLOSSOM DEARIE from her album May I Come In? “Corcovado.” 1998. So is it time for Ocean Grove to become part of Asbury Park? (I know you will say that Neptune Township voters would never allow the cash cow to leave.) But would this bring lower taxes, higher real estate prices, and better services for Ocean Grove aka the new Asbury Park South?